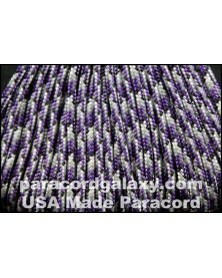 Uber Glow in the Dark White 275 Paracord (Polyester/Nylon). Made in USA. This cord is firm, crisp and quality. It is much brighter than any cord I have seen. In fact,it is so bright that I take my bracelet off when I sleep. If you put your hand, bracelet, close to your face when you sleep, it will wake you up.